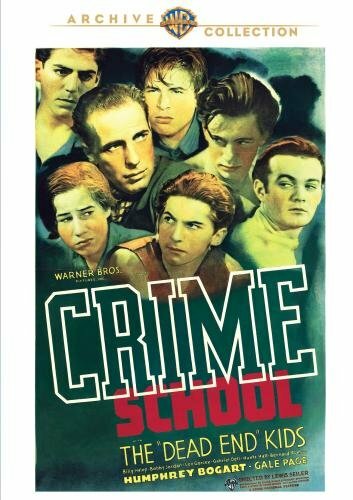 Crime School (1938) starring Humphrey Bogart and the Dead End Kids – A surprisingly good movie, Crime School stars Humphrey Bogart as the crusading warden trying to turn a corrupt reform school around – with the Dead End kids as the biggest trouble-makers! A junk man does business with the Dead End Kids: Frankie , Squirt , Spike , Goofy , Fats , and Bugs . When the boys ask for a $20 payoff, “Junkie” refuses and offers them $5. In rage, Spike assaults the man, and the junk man falls to the floor and doesn’t move. At their trial, when the Judge cannot convince the boys to divulge which one struck the blow, they are all sent to reform school. The superintendent of the state reformatories, Mark Braden (Humphrey Bogart), visits the school and finds that it is being grossly mismanaged. He fires Morgan, the cruel warden, and four ex-convict guards, while retaining the head guard, Cooper. Bogart runs the school himself and attempts to reform the kids, while romancing Frankie’s sister, Sue. Meanwhile, Cooper is afraid that Bogart will learn of Morgan’s illegal use of the food budget, which would implicate him as well. After learning that Spike is the one who struck the blow and blackmails him. He gets him to tell Frankie that Bogart is forcing Sue to pay for the special treatment the boys have received. Although false, it causes the kids to escape from the school. On the outside, they confront Bogart and learn the truth. Cooper “discovers” that the kids have escaped and Morgan calls the press to discredit Bogart and get him fired. Once the kids are back at the school and the police arrive, Bogart delivers evidence about Morgan’s fraud, and Morgan is arrested, with a happy ending all around. Officer Hogan: What are you kids cookin’ up now? Some way to rob a bank? Frankie Warren: Go on! Whatta yuh talkin’ about? Spike: We ain’t done nuthin’! Officer Hogan: Oh, yeah? Whenever you and your gang get together, I smell trouble in the wind, and it comes down the street like a garbage wagon. Come on, break it up! Bugs: [seeing Goofy in an ill-fitting suit] What are you all dressed up for? Goofy: Me and Pops was over to see Mom. She’s in the county jail. Goofy: Thirty days. Pop’s goin’ next ‘cause he’s gonna beat up Mama when she gets out. John Brower – Judge’s Assistant: Richard Slade. Goofy: [telling the judge why his parents are not at the hearing] Me mother’s in jail, me old man went to get the check. We’re on relief. Judge Clinton: Richard, are you going to help me out and tell me what happened? Goofy: Sure Judge. I’ll tell. I’ll confess. Goofy: I’m gonna talk. I’m gonna talk. Well Judge, I’ll tell you how it happened. We were forced to do what we done, Judge. You see, Judge, Junkie’s the head of a gang of crooks and they had us in their clutches. They was making us steal for them. Then we said we wouldn’t steal no more, so they tried to knock us off. There we was, Judge, outnumbered two to one – a fight for life. But we came through. Judge Clinton: A very poor story, Richard. Goofy: Yeah, that’s what I thought. It’s playing down at Gem Theater. Judge Clinton: You have quite a record, haven’t you, Charles? Sue Warren: [Pleading] I’ll take him away to a better neighborhood. I’ll have more time to spend with him. Give ‘em a chance, will yuh? Judge Clinton: I’m afraid it’s too late for that, Miss Warren. Sue Warren: Too late? How can you say a thing like that? Maybe he’sd a little tough, but a kid’s got to be tough in our neighborhood to stay alive. If you send him to reform school, I know what’s gonna happen to him. He’ll come out hard and mean and bitter. If you want to do something for these boys, why don’t you clean up the slums? Why don’t you give ‘em a decent place to live in? Give ‘em some of the things other boys have! Give ‘em a chance in life! Morgan: Those guards you fired were valuable men. Whatta you want to replace them with? A crew of schoolteachers? Mark Braden (Humphrey Bogart): Maybe you got things just a little twisted, Morgan. This is a school you’re running and not a prison. You’re dealing with kids, not hardened criminals!